Adobe creates one of the world’s most popular video editors, but so far its mobile offerings have been largely limited to iOS. 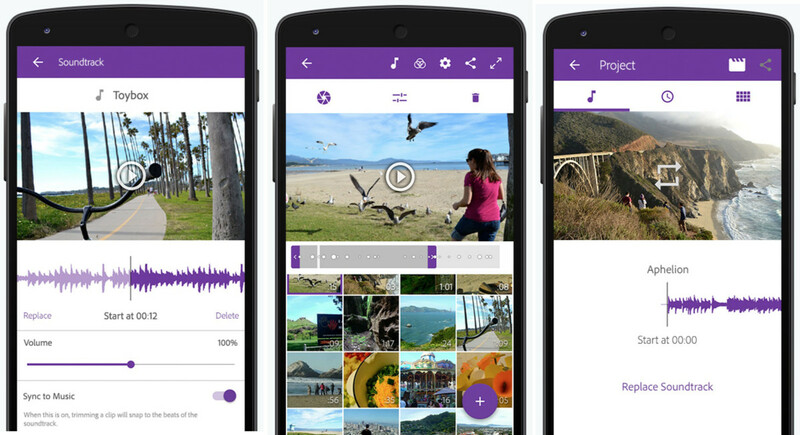 Not anymore: the company today released Adobe Premiere Clip, a lightweight version of its popular desktop program. As such, don’t expect it to be able to do everything you can on a professional video rig, but it’s pretty robust. You can drag and drop clips into the order you like, trim the parts you want to delete, and adjust lighting, transitions, and effects. You can also use an aptly-named ‘Sync to Music feature’ to automatically edit your clips so they match the beat of your soundtrack. Speaking of sound, the app allows you to choose from a set of stock soundtracks, or add your own playlist. It even includes automatic leveling features to make sure everything is at the right volume. If you don’t feel like putting in all the work, you can just use an automatic video creation tool; pick a soundtrack, and Adobe will automatically organize your clips. Once you’re done , you can import them into the full fledged desktop app. Premiere Clip launched on iOS last year, so it’s been a long time coming for Android users. You can download it from the Play Store for free now.